When you have a part with features close to a bend, such as opposing bends, hardware, louvers, half-shears, or embosses, interference with the die can be a real problem. Mate’s pillar dies have maximum clearance front and back without jeopardizing the structural integrity of the tool giving your operators maximum flexibility in sequencing bends. It’s time consuming for the engineering department to analyze every formed part to see if there may be an interference issue while forming the part. It’s even worse when the operator is 30 minutes into a setup, after trying a few different bending sequences, realizes that this seemingly simple part can’t be made in one setup because there isn’t enough clearance in the front or back of the die. With Mate pillar dies those interference problems will be few and far between. Mate pillar dies are true precision ground tools. All of the wear surfaces are hardened to 56-60 HRC to a depth of .118” to .158” so they will hold their dimensions for a long time. Mate pillar dies are self-aligning so you can skip the die alignment process during setup. Just load them and proceed. Mate pillar dies are solid one piece tools that will not have issues with stacked tolerance that you might get from a three piece stack up of a die holder, die rail, and die. Imagine just minimal wear of .001” on each of the three stacked components could cause angular variance of more than 1 degree along the length of a bend. More variables just add to setup time. The 2.362” (60mm) wide stable base minimizes the chance of damaging the press brake bed in case of an accidental overload. 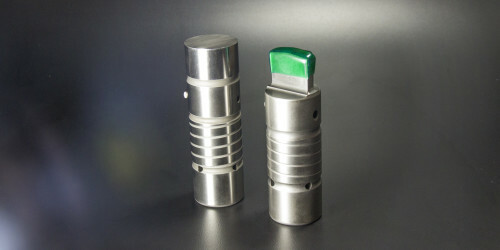 They are available in 7 standard V openings from .236” to .984” in 7 different standard angles 90, 88, 85, 60, 45, 35, and 30. The standard heights are 3.150” and 4.724”. That’s 98 different standard pillar dies. Custom V openings, angles, and heights are available by special order as well. Pillar dies are designed for European Precision Style brakes and we have adaptors available to fit most other style brakes. 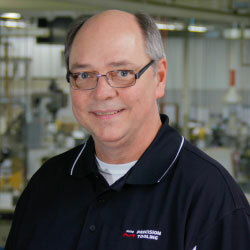 Many customers have realized significant reductions in tool replacement cost and setup times with pillar dies. Mate pillar dies are a solid solution that’s definitely worth looking at.